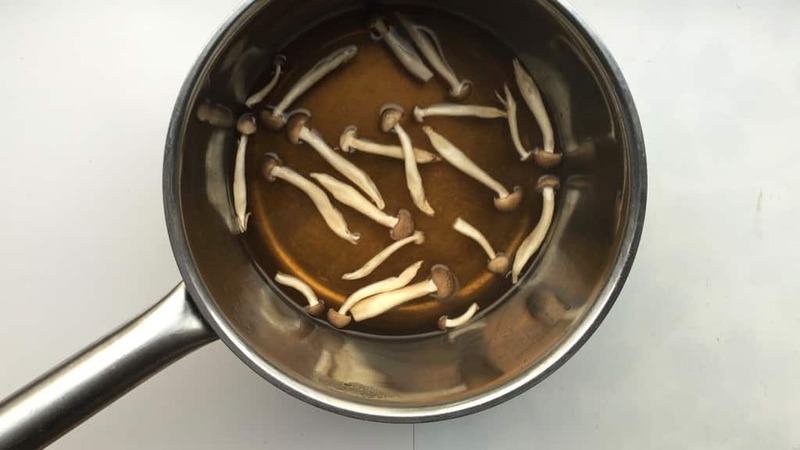 Japanese Mushroom Soup Recipe | Simple. Tasty. Good. Yes, you can cook Japanese at home using everyday ingredients! Try out this Japanese mushroom soup then with my homemade substitute for dashi!! Dashi is a Japanese soup base, like a stock or broth. It is basically water in which seaweed and bonito flakes have marinated. Once drained, the dashi is a clear broth with a subtle flavor without tasting fishy. But dashi is not easy to find here because it is not an everyday ingredient so I will show you how to make a simple substitute. I’m not trying to copy that authentic dashi flavor but I still want to create an interesting stock for my soup using ingredients that are more easier to find. My alternatives: nori seaweed, fish sauce and dried shiitake mushrooms, if I have some in my cupboard. Try it then: you’ll see it is delicious! What mushrooms should you use then? 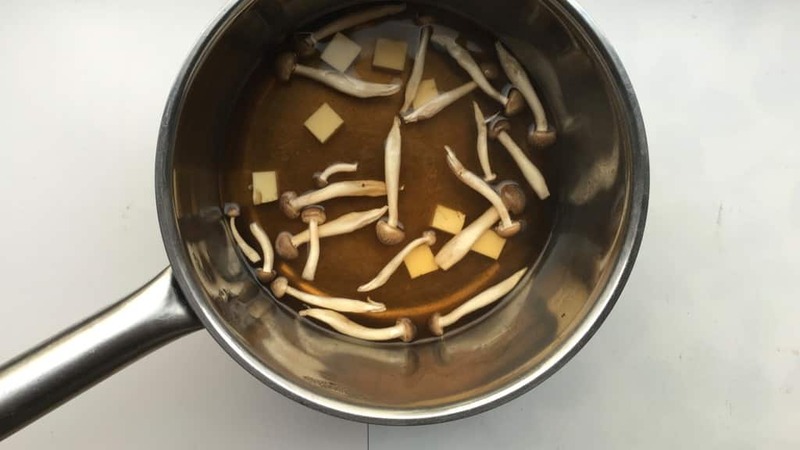 I happened to find these exotic looking shimeji mushrooms in my local and I thought they would be just great for this Japanese mushroom soup. 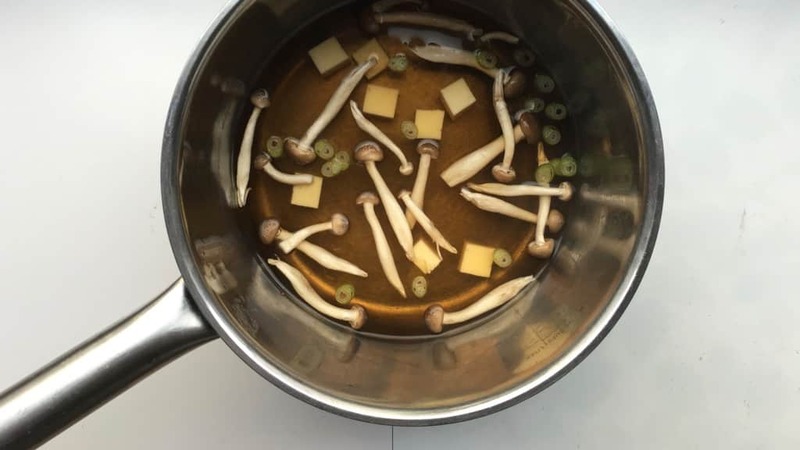 Honestly, I think that just any type of mushroom would be great for this soup. The classic white mushrooms would be great becauze those are very easy to find. But I reckon oyster mushrooms, shiitake, portobello, eryngii and even porcini would taste great in this soup. Do you love soups with that little extra touch? Then also check out my prawn ramen soup as well! Or how about my delicious miso and soba noodle soup with smoked salmon sushi? You can cook Japanese at home using everyday ingredients! Try out this Japanese mushroom soup then with my homemade substitute for dashi!! Pour the water in a large saucepan and place it over medium heat until simmering. Don’t let it boil fiercely. 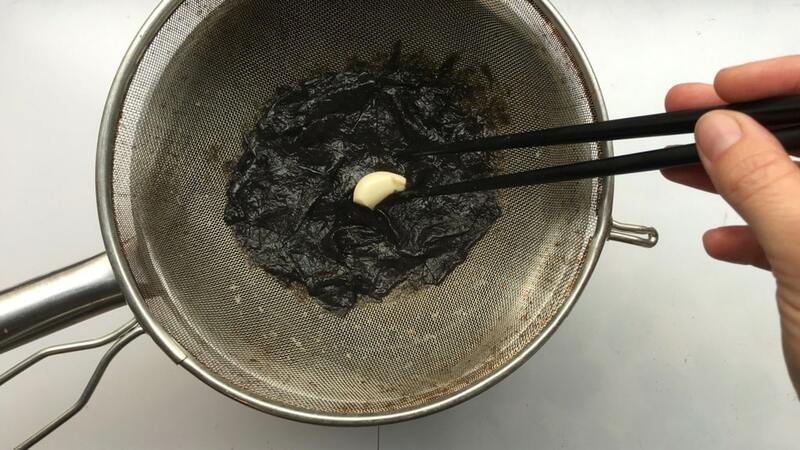 Once the water is warm, add the nori seaweed, the peeled garlic clove and the fish sauce. Put a lid on the pan and let the ingredients simmer in the warm water for 5 minutes. Then take the pan off the heat and put it aside for another 10 minutes. 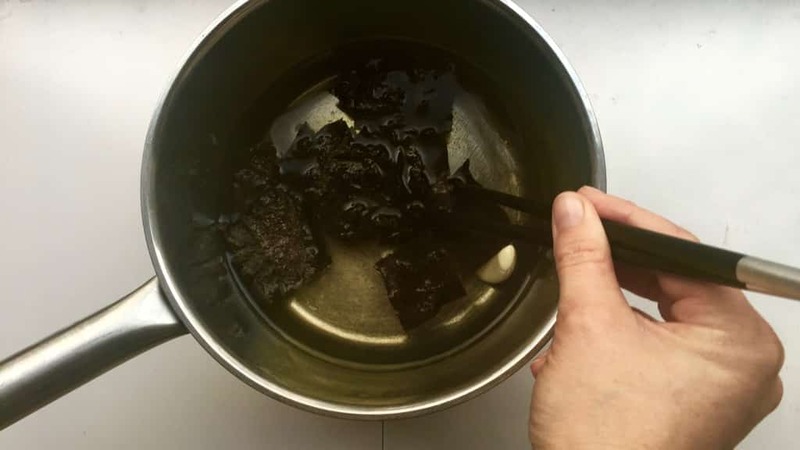 Drain the flavored soup base and discard the cooked seaweed and the garlic clove. Place the soup base over medium heat again and add the mushrooms. If you are using white mushrooms, slice them up first. Cook them for a minute and then add the soy sauce (or red miso) and the diced tofu. Check the seasoning of the soup and add extra salt, soy sauce or miso to taste if necessary. Also add the sliced spring onion right in the end. 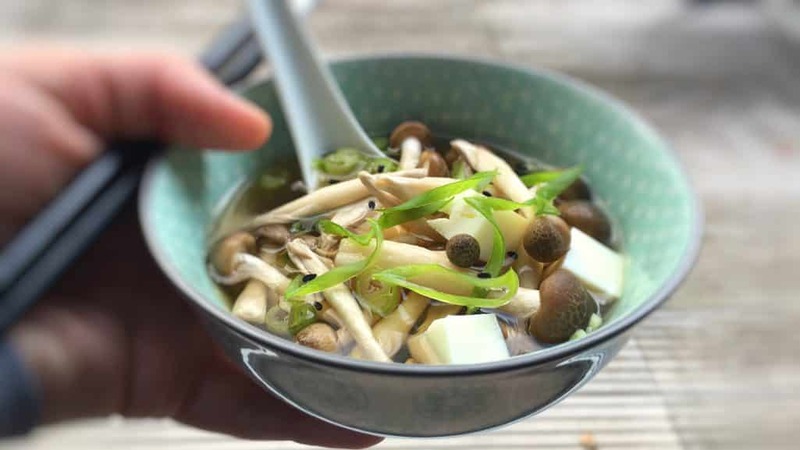 Then scoop the Japanese mushrooms soup into large bowls and garnish with extra sliced spring onion. Serve this soup hot.